Don't forget you will need a valid Motorcycle theory test and CBT before you can take a practical test. The test is in two parts , module one and module two. They can be taken separately or together but one must be passed before taking two. our advice is usually to separate them. Module one is valid until your theory test expires. If you dont pass module one there is a 3 clear day wait before re-taking. For module two there is a ten clear day wait for retest. The cost of module one is £15.50. Module two is £75. Module one consists of about 15 minutes of exercises carried out at the DSA's Multi purpose Test Centre on their maneouvering area(MMA as they call it), including a U turn , Slalom, Fig 8 and swerve and brake tests. Once completed you are eligible for your part two, which is detailed below. On this area are the various exercises shown on the diagram. You will carry them out one at a time and they will be explained to you fully before you move off. Please make sure you treat it as if you are on the road because they WILL be watching to see that you do the correct observations etc before moving off. Obviously this needs a fair amount of space, which we fortunately have here at the aerodrome. Module 2 is about a 40 minute road ride. You will not have to do any further exercises on the road. The two parts can be taken seperately or together depending on choice and availability. Below is a link to the DSA web site. The diagram is the layout for the maneouvres you will have to complete. We have this on our site and can practice all the exercises fully, including a speed gun so you will KNOW you are reaching the standard before you ever go to test. 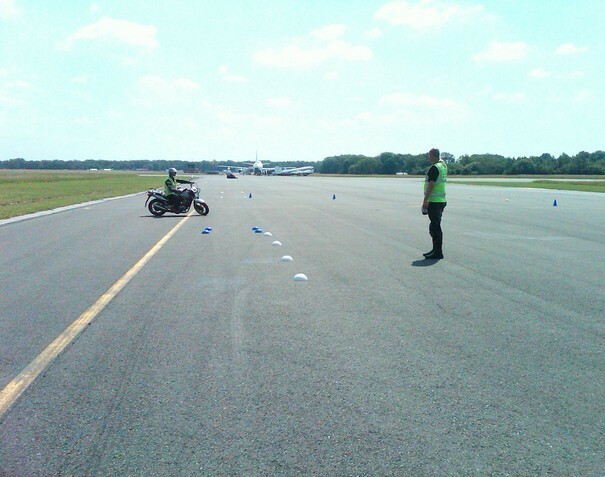 The practical motorcycle test is made up of lots of different elements, an eyesight test, vehicle safety questions, a test of driving ability, a test of specific manoeuvres and a question about riding with a passenger. At the test centre you must present a valid certificate DL196 , your UK driving licence, theory pass and mod one pass when taking mod 2. Before you actually start your Module 2 you will be asked to read a number plate to prove you can meet the eyesight requirements. You will also be asked two machine safety check questions and one pillion related question before moving away. To see a list of all the possible combinations of questions you can be asked by the examiner, see below. tell me how you would check that the engine has sufficient oil. Identify where to check level, i.e. dipstick or sight glass. The bike should be upright and have been standing for 5 mins. Explain that level should be between max and min marks. For dipstick remove dipstick and wipe clean, return and remove again to check oil level against max/min marks. how you would check that you have a safe level of hydraulic fluid. Identify reservoir, check level against high/low markings. Again bike upright. Operate switch (turn on ignition if necessary), Stand on the right side of the bike, so that you can operate both hand and foot brakes. Ensure sidelight, dipped beam, main beam and both front indicators work. Move to rear and check tail light and both rear indicators. Operate both brakes and check brake light. Identify reflectors. Operate brake, place hand over light or make use of reflections in windows, garage doors, etc, or ask someone to help. Handlebars should be free to move smoothly from full left lock to full right lock without any control cables being stretched, trapped or pinched and without any snagging between moving and fixedparts. and that their general condition is safe to use on the road. Correct tyre pressure settings can be found in the owner’s manual. Pressures should be checked using a reliable gauge. Tread depth must be at least 1mm deep, forming a continuous band at least ¾ of the breadth of the tread and all the wayaround. There should be no lumps, bulges or tears. Wheel the machine forward and apply the front brake. Ensure it stops correctly with no spongyness at the lever. Ensure both brakes stop wheels. After the practical part of the test the candidate will be asked a question on ''balance when carrying a passenger''. What must your bike have to allow you to take a passenger? What would you tell an inexperienced person who was going to be your pillion passenger? Straddle the bike - don't sit "side-saddle"
Before carrying a pillion passenger, what would you consider adjusting on your bike? How would the handling of a bike be affected by carrying a passenger? Longer breaking distance. Also, under heavy breaking all the weight is transferred forward and the pillion may push into the back of the rider resulting in controlling difficulties. Slower acceleration so look for larger gaps in traffic when pulling out at junctions and roundabouts. Steering becomes lighter because there is less pressure on the front tyre. Particularly when going slowly or under acceleration. Cornering. The motorcycle may lean into a corner more than you think, so you must compensate for this. Balance. Especially at low speed, balance is affected. If you pass and have a photocard driving licence issued after 1 March, 2004 the examiner will ask you if you want your full driving licence issued to you automatically. If you want to use this service, the examiner will take your old licence off you, scan the details and send them electronically to the Driver and Vehicle Licensing Agency (DVLA). You will then be given a pass certificate to prove you passed your test. DVLA will then send you your new full licence by post within three weeks of you passing your practical test. If you pass your test but do not want to use this automatic service, or have a licence issued before 1 March 2004, you will be given a pass certificate by the examiner. On the back of the pass certificate it tells you what you need to do next. This involves sending your licence to DVLA who will then check your application and issue you with a new full licence. If you fail the test you should ask the examiner for some feedback to help prepare yourself for your next test. Your driving report form will also show you where you made any mistakes. You must wait 10 clear working days after your practical part two test before you can book another one. Any vehicle presented for use in a driving test must meet minimum test vehicle standards. These standards are part of European Community legislation on driver licensing. Great Britain as a member of the European Union is obliged to comply with these requirements. Below are the minimum test vehicle requirements for mopeds and motorcycles. A moped must have an engine capacity not exceeding 50 cc, and a maximum speed of 50 kilometres per hour (km/h) which is approximately equivalent to 31 miles per hour (mph). If first used before 1 August 1977, it must be equipped with pedals by which it can be propelled. If you pass your practical test on a motorcycle with automatic or semi-automatic transmission, it will be recorded on your pass certificate and your licence. Your full licence entitlement will be restricted to automatic motorcycles. Only candidates with certain disabilities can use a motorcycle and side-car combination for the test. The minimum test vehicle requirements for a motorcycle and side-car are the same as the solo machines, but categories A and A1 must not exceed a power to weight ratio of 0.16 kW/kg. Passengers are not allowed to ride in the sidecar during the test. The licence obtained as a result of this test will be restricted to this combination of vehicle. DSA is reminding learner motorcyclists to wear suitable clothing when they take their module one and two motorcycle tests. While most motorcycle trainers encourage their pupils to wear the best protective motorcycle gear that they can afford, some candidates aren’t following this advice. DSA doesn’t want to restrict candidates to wearing the most expensive protective motorcycle clothing. However, DSA’s examiners won’t ignore or condone riding a motorcycle or scooter while wearing unsuitable clothing. From 1 July, examiners might tell you that your test won’t go ahead if you arrive inappropriately dressed. However, where possible, examiners will give you the chance to find suitable clothing within the time available. DSA won’t pay out-of-pocket expenses if your test is cancelled because of inappropriate clothing. Recently there have been cases where candidates have arrived unsuitably dressed for the practical test. This has included wearing lightweight nylon shell suits, lightweight canvas training shoes, or wearing no gloves.